01:22 – They are making me sit through the putting different hands up in the air moment at the restaurant… can’t they skip this bit?! my heart can’t take it. 03:30 – I thought Yi Suk was there to meet madam oh (grandma Hong Do) so why was the grandfather surprised that he was there? 05:45 – Hong Do needs to stop saying sorry and actually explain why she dressed up as a grandma!! Yi Suk is mad/upset right now, he thinks she played him, so why is she just saying sorry?? 07:00 – She could have explained better, but I’m glad that Yi Suk is sort of trying to understand her and not let her leave. 12:00 – I think a little piece of my heart just died…. I like that he gave her an opportunity to explain herself, but as a psychiatrist shouldn’t he be more understanding of her situation? She told Yi Suk straight that she was ashamed of herself for what she was doing so couldn’t tell him. Couldn’t his words have been less harsh? Shouldn’t he be worried that her phobia gets worse again? 13:42 – Se Ro Fighting!! I love how forthright and open these characters can be! 17:20 – I love that Det. Jang is trying to make a conscious effort to get over Hong Do, but I just feel so sad right now. She is losing the two people in her life who have been constant for a while now… how is she going to cope?? Ahh Yi Suk come back!!! 17:48 – Det. Jang kissed her… at least Yi Suk wasn’t there. 30:30 – I love that Hong Do and Se Ro had a cute little chat about their feelings, so cute!! And I sense a makeover coming!!! Yi Suk just got told off hahahaha~ It wouldn’t be a kdrama without characters randomly talking to themselves in public/inappropriate places! 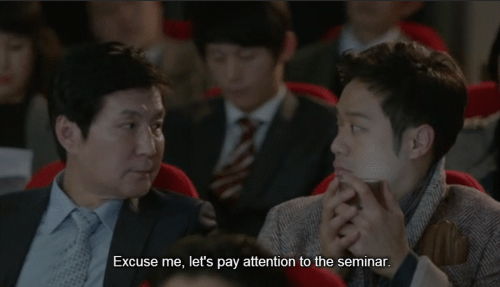 38:15 – Yi Suk is so quick to forgive and understand, I love that as soon as he knew Hong Do was outside the seminar place he left! 44:36 – Se Ro hit the nail on the head! Det. Jang is essentially Hong Do’s older brother. He cares for her and doesn’t want her to get hurt and he loves her (but does he love her romantically? I don’t truly think so). 48:21 – awww Det. Jang gets super emotional when he drinks. I feel sad for him because he is very nice, but at the same time, I’m too invested in Yi Suk and Hong Do to really care too much…. is that bad of me? 53:05 – Well that’s it my heart has finally broken and I want Grandma Hong Do to get with the grandfather… *cries* why is this so sad and complicated?! I never imagined this relationship would hurt me so much!! 56:31 – OH MY GOD!! NOOOO!!! This is not the best way to find out that the person you are in love with is actually not that person, but someone dressed as their dead grandmother. And your grandson knew about it!! 59:43 – Having the grandfather digging up information on Hong Do’s grandmother is not going to bode well for Hong Do or Yi Suk. He’s pretty angry and upset, I hope it doesn’t cause too much trouble! 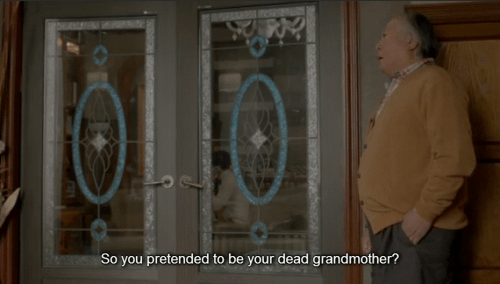 01:01:50 – Uh-oh Grandfather called Yi Suk and is ordering him home!! This is bad, he sounded super angry. (on a side note: Butler Ahn works quickly! I hope he is getting paid well haha).